The four best months for hiking in Ireland on the Dingle Peninsula are April, May, September, and October. You can certainly hike during the other months, but, in our opinion, these four months offer the best chance for minimal rain, agreeable temperatures, and good visibility. The Dingle Way explores this ancient corner of Ireland during a 10-day tour. The starts in County Kerry, Ireland, and follows winding coastline trails, backcountry lanes, farm roads, and hilltop tracks. You will begin your journey in Tralee, the capital of County Kerry. It is easily accessible by train and/or bus from all major Irish airports and ports of entry. The first night will be spent in a stellar, welcoming four-star hotel with friendly staff and superior facilities. The following day you’ll follow an easy sequence of back roads, alleys, and canal ways. Then you’ll climb the Slieve Mish range of hills. Get some kicks and extra adventure in some easy, well-maintained stream crossings where you will then reach the hamlet of Camp Village. The next day’s adventure takes you to Annascaul. Travel by secluded, peaceful farming roads into the hills and enjoy views of the Emlagh river before heading to Inch Beach. A quaint pub and cafe will greet you here. Enjoy food and drink with the locals. When you depart the next morning, you’ll be heading for the shoreline and Minard Castle, the largest fortress on the Dingle peninsula. our itinerary has you settled here in Dingle for two nights and gives plenty of opportunities to gaze on the breathtaking beauty of Southern Ireland. Spend your day wandering the quaint hamlets and visiting any of 52 pubs in the area! Today you’ll move on to Dunquin. you’ll enter through Ventry Harbor and have gorgeous views of islands off the coast as you follow the shore. After a day of exploring we’ve booked you a wonderful B&B to relax for the evening. You’ll make your way to Feohanagh by way of sea cliffs, coves, and beaches. Your day finishes at the base of Brandon Mountain, the second highest peak in Ireland. Traveling from Feohanagh to Cloghane is one of the most challenging days of the trip. You’ll climb over 2,000 feet towards the summit of Brandon Mountain. While tough, the views are outstanding and truly give you a bird’s eye view of the incredible landscape. After a night of excellent rest in a comfortable inn, you’ll amble along the coastline to Castlegregory. It truly is a gorgeous section of the coast with up to 17 miles of coastline hiking for you to discover. your last night’s stay is at a luxury 5-star bed and breakfast before you depart the following morning. Looking for a fun fall getaway? The time is now! Check out Ireland | The Dingle Way. 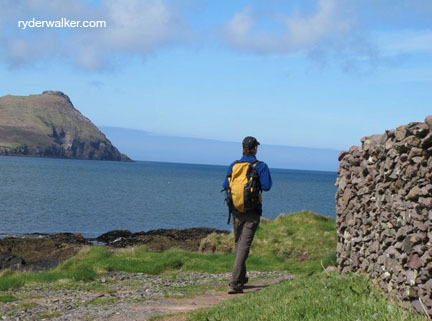 Image: Branford Walker explores Dingle’s rugged coastline. The Dingle Way, Ireland | By Karen Walker.